Saint Nicholas is one of the most beloved saints of the Orthodox Church. He is remembered for the miracles he worked, his generosity, and for the love he had for his flock. These words came true, such as on the day when divine grace revealed to Fr. Nicholas the situation of a debt-ridden man who had no money to support his daughters nor to offer a dowry for each of them to get married. So, the debt-ridden man planned to sell his daughters into slavery. Fr. Nicholas, not one to let such things occur, took a purse of 300 gold coins and dropped it through an open window at the man’s house. The debt-ridden man rejoiced upon finding the gift as it would allow his first daughter to get married to a good man. Some time later, the same man found another purse of coins just like the first. He wondered at just who could have given such a gift as it now would allow his second daughter to get married. Again some time later, Fr. Nicholas returned and threw another purse of coins through the open window. But this time the debt-ridden man saw Fr. Nicholas and, having caught him, fell down at his feet and thanked God and Fr. Nicholas for such generosity as it had saved his daughters. But Fr. Nicholas sought not the praise of men and so he asked him to say nothing of this event during his lifetime. The Grace of God working through this holy man shone through again when one day, Fr. Nicholas went to the Holy Land on a pilgrimage to visit the sacred sites. On the way there, his ship encountered a terrible storm and was in danger of sinking. Fr. Nicholas prayed, and then suddenly the surrounding sea went calm. Now out of danger, the ship sailed on safely to Jerusalem. All the sailors thanked God for the miracle they received through His servant Fr. Nicholas. In the Holy Land, Fr. Nicholas lived in a cave near Beit Jala for several years. He wanted to remain as a hermit, but in a dream he learned that God wanted him to return home to serve as a bishop. In the early fourth century, the great persecution of the Christians began under the Emperors Diocletian and Maximian. Christian gatherings were forbidden and churches and sacred books were destroyed. Bishop Nicholas and many other Christians were arrested, tortured, and cast into prison. He suffered greatly for the faith but remained steadfast, teaching his fellow inmates about Christ. When Constantine finally became the Emperor, Nicholas and all the Christians were released. But then a new threat emerged, the Arian heresy, which falsely taught that Christ was a created being and not divine. The Emperor Constantine called for a council to be held in Nicea in 325 AD which came to be known as the First Ecumenical Council. Bishop Nicholas was one of the 318 bishops that attended this council where the false teaching was condemned and the first eleven articles of the Creed were confirmed. St. Nicholas served his flock for many more years until his repose in the mid-fourth century. But even after his death miracles continued to occur when people sought his intercessions. Such a miracle involved a man from Constantinople who went on a voyage across the sea. When the ship he sailed on encountered a storm, the man fell into the sea. He began praying, “St. Nicholas, please save me! St. Nicholas, please save me!” Then suddenly, the man found himself back in his house in Constantinople. He was safe again on dry land but still dripping wet with seawater. He went straight to the Church of St. Nicholas and fell prostrate before the saint’s icon to give thanks to God for such a miracle. We remember Saint Nicholas every year on his feast day on December 6th. He is the patron saint of sailors and fishermen. People still visit the church in his home town of Myra of Asia Minor, which is now in the city of Demre, Turkey. 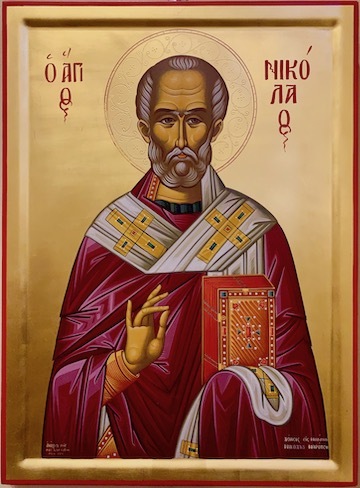 Although most people think of Santa Claus when they hear the name St. Nicholas, Orthodox Christians remember him as a model for bishops and great defender of the Orthodox Faith. St. Nicholas, please pray for us!